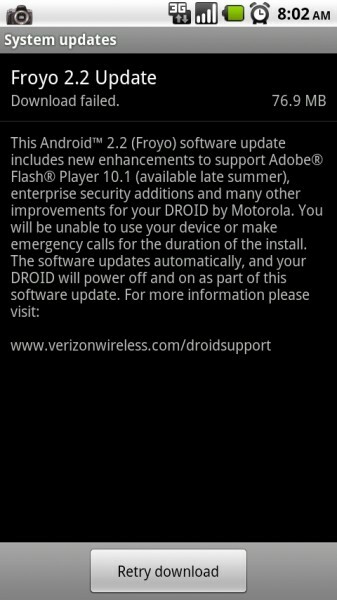 Anyone with an original Droid is supposed to receive a minor Android 2.2 update over the next few days which will allow them to download official Flash 10.1 from the market and so far, we’ve seen some odd stuff happening. From the shot above, you can see that one of our readers was sent an update, only this thing wasn’t 1.6MB like we saw yesterday, but was the full 2.2 OTA update with some added goodies inside (original was only 45.2MB). 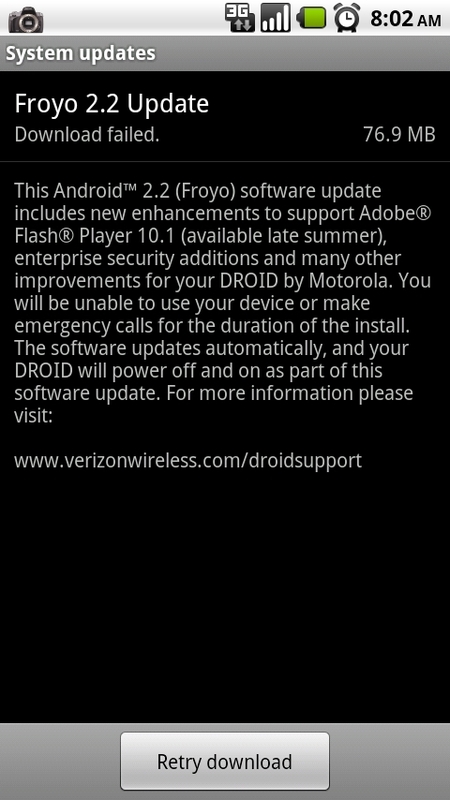 Since this reader is rooted (hence the dropcap2 icon), this is the new OTA update that will be sent out if you are not currently running FRG01B (which is the previous update). We’re pretty sure this is FRG22. Update: This is just the full FRG01B, not FRG22. No idea where we are actually going right now, but just be aware that a batch of updates are floating around for your downloading pleasure. If you are already running FRG01B, you should see FRG22D which is only 1.6MB. If you are rooted and blocked FRG01B, then you will likely be prompted to install this new 76MB file. It should be blocked by your custom recovery as they all have in the past. Oh and remember, you can download official Flash right here if you don’t feel like waiting. Anyone receive an update yet?